I got home from work one day feeling particularly frazzled. It had been a stressful day, for whatever reason, and I desperately needed a way to wind down and switch off from the day. I tried my usual technique of going for a brisk walk around the block, but this did nothing to calm me down. I tried watching TV to distract me, but this didn’t help either. After wandering around in a hapless manner for a while, I decided that the only thing that would relax me was baking. I wanted the soothing reassurance of putting ingredients together and seeing them transform into something else. And I decided that baking bread would do the trick. There is something about the process of mixing the dough, kneading it into submission, then watching it rise, that I knew would provide the calming effect I was after. I read in a recipe book once that bread just needs flour, a yeast and a liquid, but these can come from all sorts of different ingredients. You could include things like beer for the yeast, and milk instead of water for the liquid. So when I make bread, I get tempted to chuck all sorts of things in. This time, I experimented with adding an egg to enrich the dough, and natural yoghurt for the moisture, both of which helped to make the dough silky and soft. 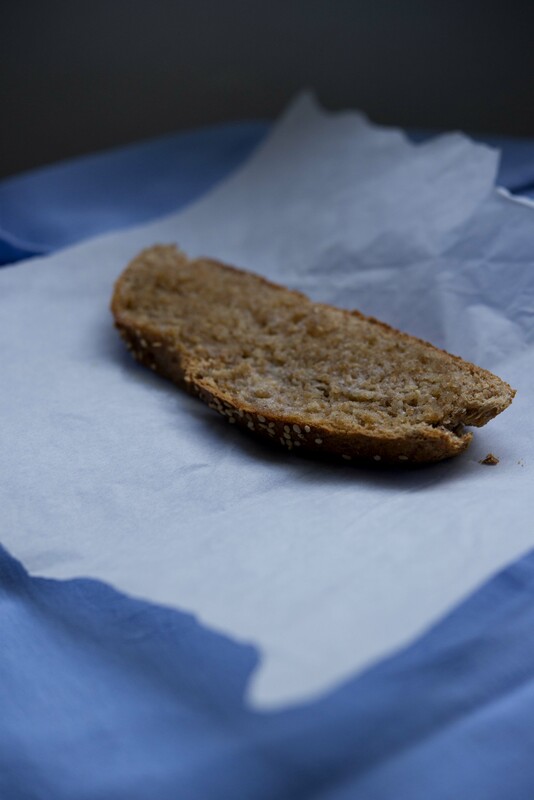 I used several flours too – mostly wholemeal, but mixed with some plain flour to lighten it slightly. I also used a little bit of Emmer flour, made from an ancient variety of wheat, that gives an interesting nutty taste to the bread. At the end of the evening, the act of inhaling the wholesome, homely, comforting smell of freshly baked bread was exactly what I needed. First, activate the yeast. But 300ml of warm water in a jug, and mix in the yeast, sugar and 1 tsp flour. Leave for 15 minutes until it starts to froth. Put the flours in a large bowl. Add the olive oil, salt, yoghurt and egg and mix together. Pour over the yeast mixture and leave to soak in for a minute or so. Bring the mixture together into a dough, and knead for 10 minutes, until a soft, supple dough forms. Put the dough back into the bowl, cover with a tea towel and leave in a warm place to rise for 1 hour, or until doubled in size. Knead briefly again, then shape into a loaf and place on a floured baking tray. Leave to rise again for half an hour. Meanwhile, preheat the oven to the highest setting (around 250C). Cut slashes in the bread with a knife – this helps it to rise in the oven. 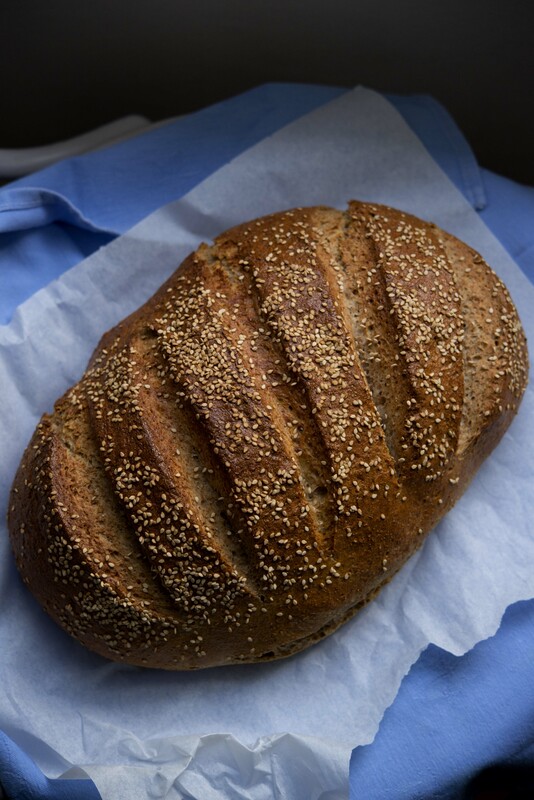 Brush the loaf with beaten egg and sprinkle with sesame seeds. Bake for 15 minutes, then turn the oven down to 180C and bake for a further 30-40 minutes. Check if the bread is done by tapping the bottom – if it sounds hollow then it’s ready, if not return to the oven for a further 10 minutes. Try a slice straight from the oven with a ridiculous amount of butter. 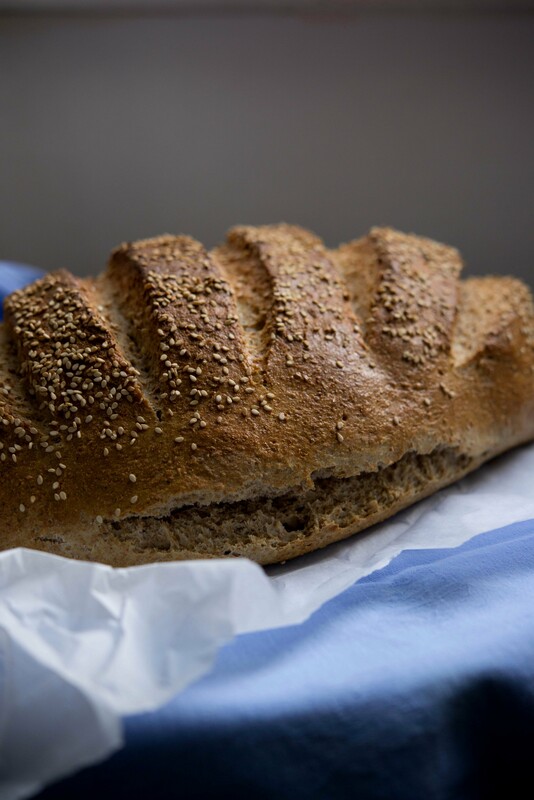 This entry was posted in Baking, Bread, Made from scratch and tagged bread, flour, sesame seeds, wholemeal bread, yeast, yoghurt. Bookmark the permalink.